In stock 44 pcs. Also available in our walk-in store. 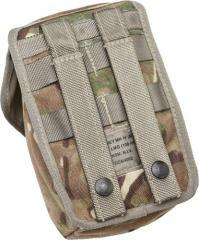 100 round ammo pouch. 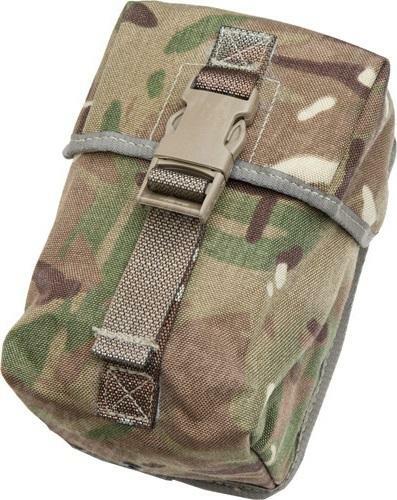 British army kit, part of the Osprey system, which means these are MOLLE compatible stuff. MTP camouflage. Made of Cordura, treated with waterproof coating on the inside. Being used, the coating might not be 100% perfect. Dimensions about 10 x 18 x 9 cm. Toimiva, oikea sotatarviketasku pikkurahalla. Majoittaa vaivatta mm. 230g kaasupatrunan, polttimen ja Savotan Stoven yhtäaikaa, tai Trangian 0,6l kaffepannun, tai Brittien PMEK:n sekä tarvittavat oheiskäikäleet, ja paljon muutakin soveltuvaa eräjormahärpäkettä. I bought 2 of these, both used but in excellent shape. the lid is held closed by an adjustable buckle, and strong Velcro. It's a good sized pouch. made extremely well. 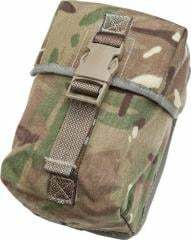 The snaps on the MOLLE straps are one-way snaps...so they are hard to snap open by accident, but when you want to open them they work with ease...all and all, an excellent piece of surplus gear.